There’s an old Irish saying that goes…An Irishman has an abiding sense of tragedy which sustains him through temporary periods of joy. Hmm, it sounds like that Irishman might be a Port FC supporter. The 13th place PTT Rayong were the visitors on St. Pats Day at St. PAT stadium. Ever since the Rayong side was promoted I have wondered aloud whether PTT stands for Pretenders to the T1 Throne or just Pretty Terrible Team? (90 minutes before kickoff) Why the forlorn looks on supporter faces? Has the Madame re-signed Vincent to a multi year contract? No, rather it’s a ban on beer sales until kick off because it’s election day. (60 minutes before kickoff) the forlorn aren’t so forlorn anymore. Did you know a popcorn cup can be used for more than just popcorn? Who knew? (Kick off)…a near sell out again. The atmosphere is electric. The big change in the home side line up is #19 Pinkong filling in for an injured Sumanya. Right from the opening minute the pace is lively. Wait a darn minute! Could someone please tell #99 for PTT Rayong he’s in the wrong sport? Middle linebackers belong in American football. Yikes, J. Emmanuel Thomas or J.E.T. is one big dude. (20′) Port strike first as Suarez delivers a lovely ball to Siwakorn in the box and he steers it over to Kevin who drills it home. 1-0. (22′) one of the story lines of this match was how would the injury depleted Port defence handle the Rayong attacks. Pinkong thwarted the first probe by the middle linebacker, uh sorry, Centre Forward J.E.T. much to the applause of the near sell out crowd. (33′) The newly acquired J.E.T. delivered a gorgeous advance ball (a jet) to blondie #9 Apiwat Pengprakone. He split the defence of Dolah and Nittipong and blasted it high to an open net. One for the highlight reels.1-1. Great support in the away stands. Rayong supporters are loud and proud. Good to have them up in T1. (44′)…J.E.T. delivers another advancer to #7 Rodriguez but Worawat makes a great save. (HT)…it’s a mad dash for the exits as the election beer ban has been lifted. I vote for more beer! (45′) Bodin subs in for Pinkong and he makes an immediate impact. He and Siwakorn and Suarez penetrate the Rayong defence several times but keeper Ruenin was easily Rayong’s MOTM. (53′) Port attack and attack again but nothing to show for it. #5 Victor is his usually pesty self. (68′) Go shot on goal? Sorry. (74′) Nitti blasts one? High. (77′) Siwakorn is subbed off for Arthit to give the Port attack more firepower. The Rayong keeper has the luck of the Irish on this St. Pats Day. (85′) I count 7 scoring chances for Port in the last 20 minutes. Wow. The match ends in a 1-1 draw. Port deserved three points in a very entertaining St. Pats Day clash. Port are in 3rd place, just one point away from top o’the league. In closing, I have some good ole Irish advice for Rayong’s #5….Never iron a four-leaf clover, Victor, because you don’t want to press your luck. Many candidates but I’ll go with Kevin. Dangerous all match. The question following that fantastic Friday night trip to Chonburi is: shouldn´t we all just stay at home the rest of the season instead of diluting our glass of football with lesser experiences? Especially with Sunday being the first election day, and hence, a dry day in all of Thailand. Well, I for one am banking on the hawkers around the PAT figuring out that the polls close at about the same time the game kicks off and that therefore they should stay open for business. If you want to be sure, going to the shop before the weekend and getting a few cans to bring with you wouldn´t hurt though. But, with Pakorn (7) having a whole night of long shots to make up for after missing Chonburi due to injury, some throats in and around the Sandpit may be better off sticking with tea anyway. After the comfortable 5-1 win over amateur minnows Thamuang FC in Port’s first FA Cup game of 2018, Port face a rather trickier assignment in the last 32. PTT Rayong sit atop T2, and have just signed a Brazilian striker who has knocked in 2 goals in his first month with the club. You might remember him, he’s called Josimar! Whilst Josi and The Oil Millionaires are looking pretty slick at the moment, having eased past Ubon Kids City (yes, really) 2-0, there are a couple of reasons they will not be relishing their trip to PAT Stadium. Firstly, they may top T2, but securing promotion is far from a formality. Both Nongbua Pitchaya and Trat are level on points with them, with Chiang Mai just one back. For a team like PTT Rayong who have been knocking on the promotion door for years, it would seem like the cups really ought to take second priority, particularly when they’re facing one of the form teams in the country on Wednesday, while promotion rivals Trat FC pay them a visit on Saturday. Secondly, Port are at home. No one wants to play Port at home. It’s usually pretty tricky to come by good information on teams outside T1, but PTT have got a few players worthy of note. Top of the list is of course Port’s top scorer in 2017, Josimar (77). The Brazilian who led Port’s attack last season was not without his critics, but there can be little doubt that he is a T1-standard striker. Fortunately, Port’s back line know very well what they’re up against and will be prepared for their teammate’s fired-up return to PAT Stadium. They will know a lot less about his striking partner, though. Dennis Murrillo (11) has spent some time in T1 with Chiang Rai and Osotspa, scoring 9 goals in 27 games, but has really found his feet in T2. He top-scored for The Oil Millionaires in 2017 and has 11 so far this season, and is another one Port would do well not to take lightly. The midfield looks rather less threatening. Journeymen thirty-somethings’ to a man, including third Brazilian Wellington Bruno (86) who is the stand-out man. Wellington had one excellent season in T1 with Chiang Rai, but with just a single goal to his name in 2018, it appears his best days are behind him. The Oil Millionaires have a useful looking ASEAN player, though. Ryuji Utomo (5) is an Indonesian-Japanese defender, and seems to be the resident hard man, having picked up 4 yellow cards and currently being suspended from league action for a straight red. Then again his Wikipedia page says he likes to read books, so you never know. Along with Koravit Namwiset (27), who was a Thai national team regular under Zico, and former Buriram full-back Anawin Jujeen (6), PTT have a defence that wouldn’t be at all out of place in T1. Including their 2-0 win over Ubon Kids City, PTT have won three, drawn two and lost one in their last six. Rather more interesting than their last 6 games, though, is who they face next. Co-leaders Trat FC travel to PTT Stadium on Saturday. It certainly isn’t outside the realms of possibility that key men could be rested with this clash in mind. Port, however, are expected to field another strong lineup. Top-scoring Sergio Suarez (5) is unfortunately unavailable having picked up a knock last week, but Kim Sung Hwan (8), who will miss the T1 visit of Sukhothai having picked up his eighth yellow card against Ubon, will be available for the cup tie. Looking at the surely unnecessary caution that was taken to secure victory against Thamuang, I expect that Port will field a near full-strength XI. The search for a system that works without Suarez goes on, with the most recent attempt – sticking Nurul (31) up front – being very unconvincing indeed. Whilst Nurul’s pace does undoubtedly cause problems for the opposition, he would be of much more use out wide, while Bodin (10) looks better suited to playing through the middle. In the last round of the cup Arthit (29) started alongside Boskovic (23) up top and notched two assists, although his all-around performance didn’t impress Port’s traveling support. Option three is bringing in Adisorn (13) and pushing Kim further forward. Against a pretty mediocre looking midfield this is certainly an idea worth considering. Whatever Jadet goes with, Port will be heavy favourites to advance to the last 16. Let’s just make sure we go in to this clash thinking that that’s the case! As with most cup games we’re not quite sure which ones will be on TV, but you can be sure that if it’s on and you can’t make it to PAT Stadium for 19:00, The Sportsman on Sukhumvit 13 will show the match on a big screen with sound. Don’t forget to wear your Port shirt for a 10% discount on drinks. The draw for round 2 (last 32) of the Chang FA Cup has been made, and Port have been drawn at home to T2 side PTT Rayong. This means a reunion with 2017 top scorer and Sandpit favourite Josimar Rodrigues, who joined PTT in the June transfer window. PTT currently lie 3rd in T2, 2 points off the top spot with a game in hand, so Port won’t be taking the game lightly and we can expect Jadet to put out – or at least be told to put out – a strong XI for the game. The match will take place on Wednesday 4 July, 19:00. You couldn’t have had a more perfect evening for football. Cool December weather, a stunning red sky over the PAT, and the Sandpit posse clad in santa hats and knocking back festive Leos. Unfortunately Port took the concept of goodwill to all men somewhat too literally and gave their T2 opponents Rayong rather too many presents, in what turned out to be a fairly unremarkable friendly. 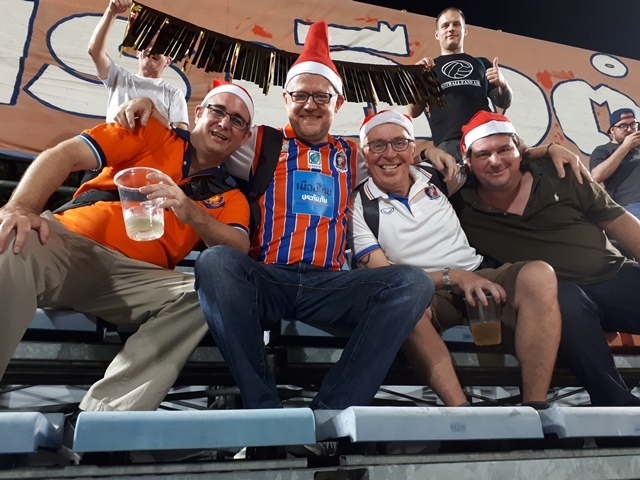 It was a Thai-only affair, with Port’s foreign contingent being given some Christmas time off – although Boskovic was watching from Zone A and I also spotted someone looking suspiciously like Kim Sung Hwan worriedly scrutinising the half-time sausages. Port kicked off the first half with a largely second string XI, including a couple of unknowns – a tall, balding centre back (no55) who didn’t impress at all, and a youth team player taking over Tana’s 99 shirt, which hopefully means the Moustachioed Assassin is on his way out. 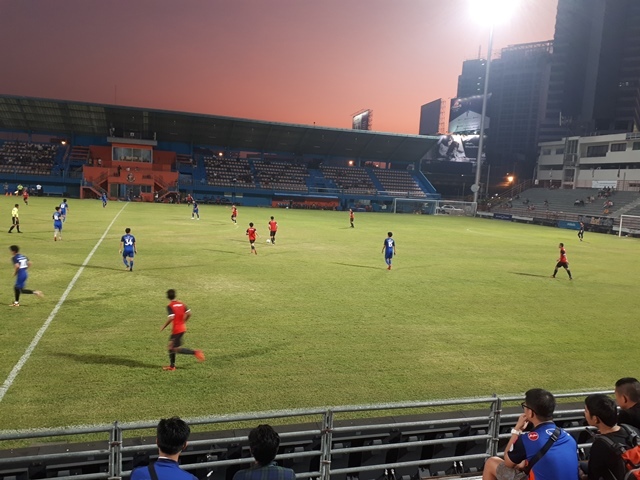 The first half hour was largely uneventful, the only action of note being Rayong’s constant and highly entertaining physical assaults on an increasingly pissed off Wuttichai (14). They’d clearly not done their homework and thought that the best way to stop Port is to stop Wuttichai, when in fact the best way to stop Port is to simply give Wuttichai the ball, stand back and let him get on with things. Foul after foul was committed on the no14, and had it been any other player we’d have been howling in outrage, but in this case we were cheering every one. The game finally came to life on the half-hour mark when a cross from the left was nodded past Watchara (66) to give Rayong a deserved lead, and five minutes later a similar move put the visitors 2-0 up. I can’t tell you the exact details as I was busy topping up my Leo. Port almost pulled one back when a trademark Pakorn (7) curler (a free-kick, not a turd, just in case you were wondering) was acrobatically tipped over the bar by the Rayong keeper. Port started the second half with a stronger side, with Worawut, Todsapol, Nitipong, Siwakorn and Adisorn all joining the side. The impressive Pummared, Pakorn, Meechok and Bodin all stayed on, though depressingly Panpanpong replaced the excellent Yossawat at LB. 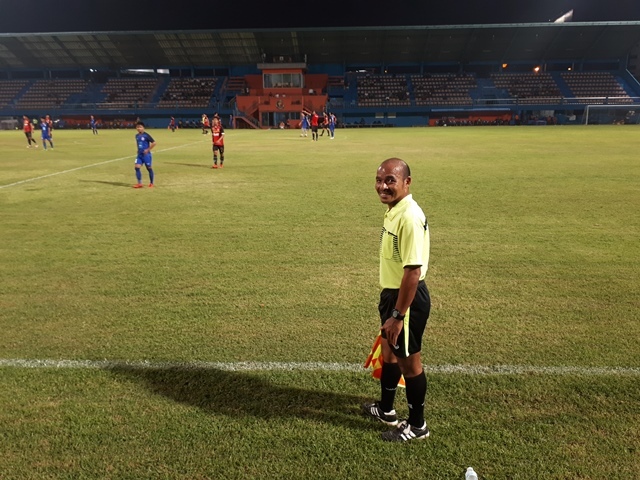 Pakorn started the siege of the Rayong goal on 52 minutes when his shot was narrowly tipped over the bar, and then on 10 minutes a lovely through ball put Nurul (31) through on goal only for the balding linesman to raise his flag for offside, which led to him getting considerable abuse from a certain santa hat-clad section of the crowd, which he took in good spirit and engaged in a bit of BANTZ. On 60 minutes, a Bodin (15) pass found Nurul who was scythed down from behind and the ref pointed to the spot, Pakorn stepping up to convert. 1-2 and the momentum was now definitely with Port, with both Nitipong (34), Pakorn and Nurul coming close to equalising. Sadly though the next goal went to the visitors, thanks to a lovely 25-yard curler into Worawut’s top corner, and they nearly made it 4 five minutes later but were denied by a brave Worawut (36) block. Port did pull one back late on, when a Pakorn free-kick picked out Bodin on the edge of the box who fired into the bottom corner, but it was too little too late, and Rayong ran out deserved 3-2 winners. Port have announced their latest pre-season friendly, at home to T2 side PTT Rayong on Saturday 23 December at 17:00. Rayong narrowly missed out on promotion to T1 last season finishing 5th, and so should provide a bit more of a test than Tonburi and Chonburi Reserves. They also have possibly the most amusingly-named goalkeeper in Thai football in Bandit Suksa. For Port fans, the game is a good excuse to gather for a few pre-Christmas Leos (Santa hats obligatory) and hopefully see new signing Dragan Boskovic make his first appearance as a Port player – what better way to celebrate the festive season than by waiting in expectation to catch a glimpse of a large bearded man?